IS THE PHILIPPINES READY FOR A THIRD TELCO? EXPERT COMMENTS | Snow Badua - PBA Latest Updates! UNLESS the government will take the cudgels, it will be hard for the Philippines to open up doors for new players in the telecom sector. This is how famed UP Professor Emeritus Dr. Epictetus Patalinghug explains the result of his research, conducted with three other esteemed UP professors. In his recent speech at the Asian Institue of Management, Patalinghug stressed that crucifying the current Globe versus PLDT rivalry will be both unfair and illogical. At present circumstances, Philippine market is not viable for the entry of foreign telecom investors considering the existing law that prohibits major foreign ownership of a company and the massive capital requirements to bridge the gap that the two existing telcos have already built over the last few decades. “A third player may have a difficult time attaining financial viability in the short run due to its late-mover disadvantage and the need to penetrate undeveloped areas whose deployment cost is higher than the almost saturated urban markets dominated by the incumbents,” said Patalinghug. “The question is do we need a new player? Looking at Digitel when they were around, they were not making a lot of money. Our analysis is that a third player can enter the market if it is cost insensitive for the next ten to fifteen years. No private firm can afford that,” he added. Patalinghug even bared that the Philippines is not alone when it comes to a two-player telecom structure with Myanmar as the other while India, the second most populous country in the world, will also join the list in the coming months. “Look at the market in India, if you look at the last report, India will move from a four player industry, they are merging into a two-player tele-commerce,” said Patalinghug. Patalinghug, second from left, after delivering a speech at the Asian Institute of Management in Makati. 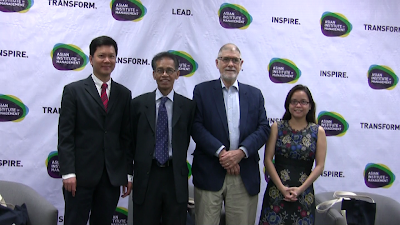 Joining him are AIM Associate Professor Wilfred Manuela, American Chamber of Commerce-Philippines Chairman John Forbes and Phl Competition Commission Economic Office head Isabela Villamil. He also revealed that during the mid-90’s the Philippines had eleven telco players. “In 1992 to 1996, we got 11 telco players in this industry. But deregulation has always been followed by consolidation. So Smart was bought by PLDT, Islacom was bought by Globe, Bayantel was bought by Globe, Sun was bought by PLDT, so from deregulation you have some consolidation,” stressed Patalinghug. “And that pattern exists all around the world, India started with six, India in the next few years will only have two,” he said. The soft-spoken educator believes that the only workable solution for the country to have a new competitor is for the government to put up its own telecommunications company. “The only realistic third player is the government, but its social value is its cost-insensitive capacity to pour investments in “last-mile” and high costs areas, and to build “last-mile” network that complements with existing networks,” he said. Meanwhile, the government thru the newly established Department Information and Communications Technology (DICT) will begin to build cell sites in different parts of the country, particularly in remote areas. But DICT undersecretary Eliseo Rio, Jr. stressed that this is mainly to help address the lack of cell sites in the country and not yet signal the birth of a state-owned telecom company. “The government will build and then lease these cell sites to small players or to those interested telcos. 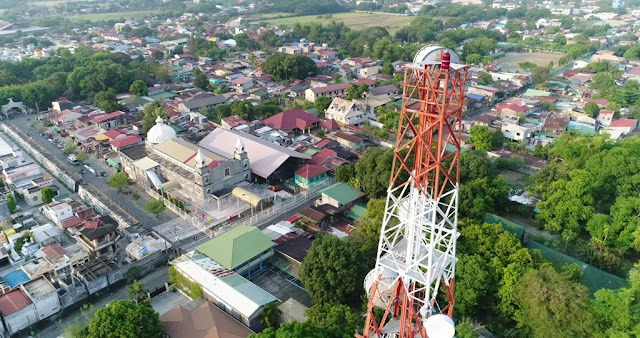 Our government (will not yet operate these structures), taking from the experience of Telepono sa Barangay, it was not a success, so maintenance and usage of these cell sites will be better off with the private companies,” said Rio. “The government’s approach is technology neutral, so everything that we can build should give cost effective transmission of communication facilities," added Rio.